Are SMSFs prepared for Amazon? With multinational company Amazon set to enter Australia, SMSF practitioners will need to review any retail stocks in their clients’ portfolios. It is now official that Amazon, a US $400 billion-plus market cap multinational is planning to set up shop in Australia. 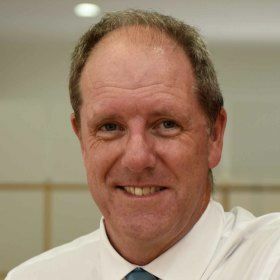 This would seem to be a ‘line in the sand’ moment for retailing in Australia and this article serves as a prompt to SMSF practitioners to ensure their clients’ investments are Amazon ready. Richard Goyder, the chief executive of Wesfarmers famously said that Amazon “won’t just eat our lunch, but breakfast and dinner as well”. Will this be the end of retailing as we know it in Australia? Like any major change, there will be winners and losers. 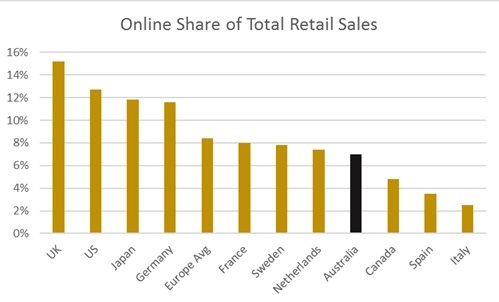 For some perspective, we start with a chart showing online retailing penetration in Australia, which is less than 8 per cent and less than other major OECD countries. 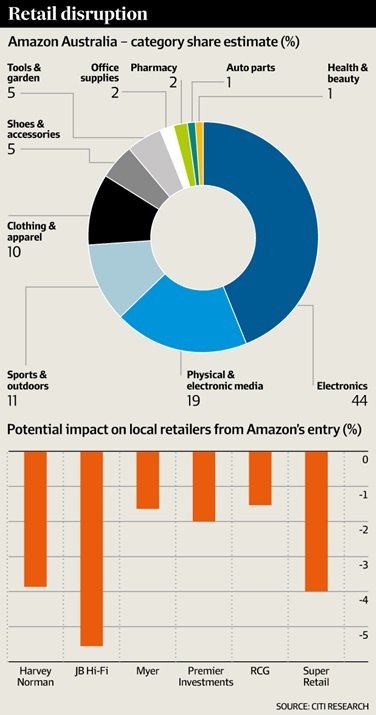 When we consider that Amazon’s market share in major countries is less than 20 per cent, this leads us to the conclusion that the retail market share Amazon is likely to gather is relatively modest, but likely to be concentrated in specific retailing sectors. 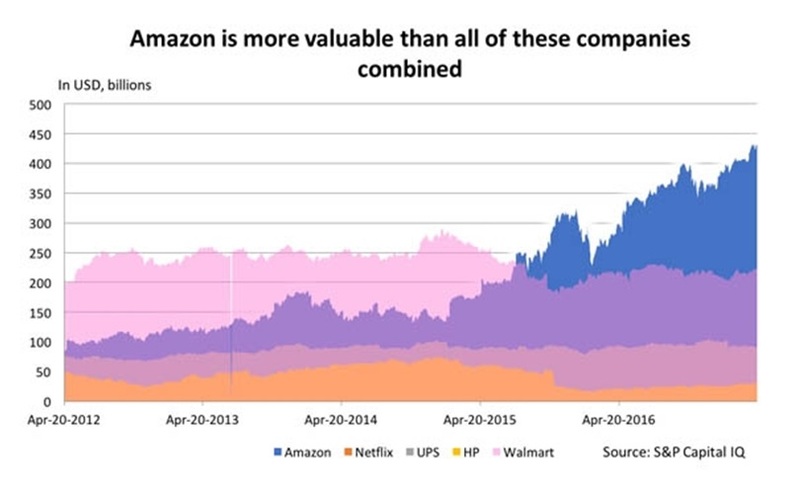 Amazon’s strengths traditionally have been in books, electronics and apparel. Its entry into furniture retailing was problematic, and is evidence that not every venture Amazon pursues will end in success. Perpetual’s deputy head of equities Vince Pezzullo recently said to us that he expected that fresh food would also be difficult for Amazon to be successful at in Australia, which probably explains the lack of share price reaction to the Amazon announcement from Woolworths and Coles. 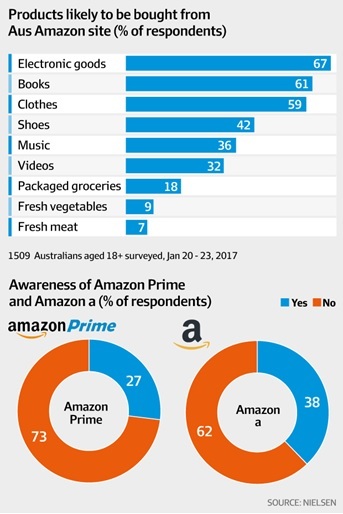 A recent survey of Australians’ buying intentions shows the likely retail sectors that feel the most pain from Amazon’s entry into Australia. The top three areas most likely to be purchased were electronic goods, books and clothes. The second level of thinking required with the Amazon entry revolves around the question of retail property. In the US, some retail property has come under pressure as a result of the increase in online shopping, particularly in regional areas. We would encourage SMSF trustees to re-evaluate their specific retail property exposures, and if they must have retail property at all, they should seek the highest quality assets. It is somewhat instructive that the Lowy family no longer owns their stake in what was formerly Westfield Retail Trust (Australian Westfield Properties). Finally, we leave readers with a snapshot of research from Citigroup that estimated the market share Amazon was likely to achieve in each market segment, followed by an estimate of the impact on sales of some of the largest retailers. Amazon is a large player, with deep pockets and is prepared to engage in low margin strategies to gain market traction. Australia’s high retail margins are its opportunity, and investors would be well-advised to exercise caution in the retail sector.